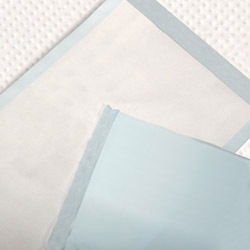 Incontinence bed pads (or underpads) are best used for providing overnight protection from symptoms of incontinence. Generally placed on top of the bed, the pads are meant to give individuals maximum comfort while sleeping. Incontinence pads placed on the mattress serves 2 major purposes. First, the underpads are used to ensure you are comfortable while sleeping and that when you wake up, you are feeling dry. Secondly, the pads are used to protect the mattress bed. Mattresses are easily stained and difficult to clean. Incontinence pads are the perfect solution to ensure you are sleeping in a clean bed every night. As with liners and diapers, not all bed pads are equal. The most important thing to look for in underpads is the ability to absorb and retain liquids without leakage. The key thing to remember is that the incontinence pad will need to be able to support your weight. A good underpad will retain all liquids even if your body tosses and turns while sleeping.